I’ve always been skeptical of company values. They all seem to say the same thing, which is not much at all. They seem dreamed up by executives in a top-down fashion because an HR handbook insisted that every company should have a values statement. And more often than anyone cares to admit, corporations are caught violating their own stated values. How many CEOs can recite the company values to which his or her firm supposedly subscribes? In light of my feelings, it may surprise you—as it does me—that recently, along with my co-founder and CTO, I developed a set of six company values for our startup culture. I put together a company values statement. I handed it to my team during our end-of-week team building and reflections time. I spoke about its importance. What motivated me to do such a thing? For whatever reason, over the last month, it seems I have implicitly encountered the question of what our company values are in a series of conversations, many of them difficult because they were directed at changing someone’s behavior, or even the perception of someone’s behavior (including my own). Maybe these conversations are inevitable at any early-stage company. We are now just large enough to elevate the chances of personality conflicts, communication blunders, priority collisions, unintended consequences, and the like. Whatever the case, there I was, formalizing company values and asking my team to get behind them. And amazingly, they did. They didn’t find them hokey, either. Why? Because they could see that the values that emerged, that were now displayed in plain sight, were values they’d felt emerge over the last month. The values had the ring of truth to them, the kind of truth that comes from relational experience, not HR handbooks. What emerged were values that developed from the bottom-up, values co-authored by our small but lionhearted company whose employees know we need to be able to praise and criticize, fight and high-five, relent and insist. It seems to me that when company values emerge from the difficult dynamics of everyday work and life, they cease to be hokey and become a statement of what has already bubbled up to the top. 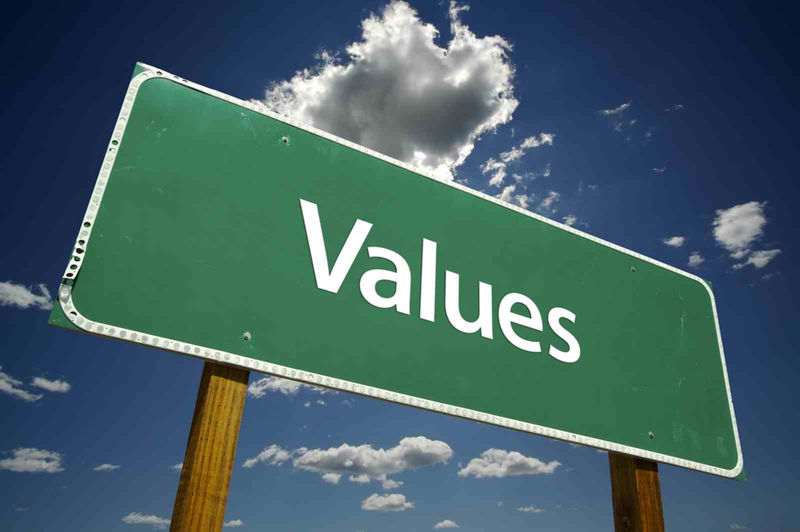 And once values are made explicit, they create a stake in the ground for everyone to aspire to. They also inform new or potential hires what kind of place this is, and what kind of people we are. Respect. We give others the benefit of the doubt, and we trust each other to do our jobs well. Positivity and optimism. Startups are tough. We believe a good “can do” attitude goes a long way. Candor and no ego. We give and receive criticism constructively and without malice. We seek to appreciate the merits of what is said regardless of rank or ego. Transparency. We do not hide or obscure the true state of things, whether about the company, the product, the team, or otherwise. Reasonableness. We adopt the “Reasonable Person Principle,” which empowers us with using our own good judgment. We think about how others would perceive an action before we carry it out. We respond receptively and not defensively when confronted that something we did seemed unreasonable to someone else. Uncompromising quality. We strive for excellence in our own work and in the work of our teammates. We quickly make our work right when it falls short of the mark. At AnswerDash, we were founded to bring people better technology experiences. In the same spirit, as a startup company, we strive to be a place where “experience” matters—our experience of a healthy workplace and our experiences of each other. The above values help us see in a mirror what we already stand for, and remind us when we forget. Our values transcend startup life. They speak to life in general.